Your smile is an important asset to your self-esteem and how others view you. Unfortunately, few people are confident about the appearance of their teeth. Often, it can seem like you have no choice but to live with the imperfections, but you do have a solution with your cosmetic dentist, Dr. Gary Nawrocki. At Nawrocki Dental, you can transform your smile with a noninvasive procedure, using porcelain veneers in Cocoa Beach. Porcelain veneers are thin shells that are bonded to the front side of the teeth to cover cosmetic imperfections while also making the them appear shapelier and more proportionate. When compared to traditional materials, porcelain looks more natural because it reflects light similarly to enamel. They are quite versatile allowing them to be used to resolve several issues that negatively impact the appearance of your teeth. 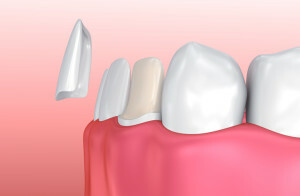 Often, veneers are used to make the teeth appear whiter when traditional whitening treatments are ineffective. Since porcelain is used, they are stain-resistant, allowing you to maintain your new bright smile. If your teeth are chipped, cracked, or have an abnormal appearance, you can quickly hide the imperfections by covering them. If you suffer from a gummy smile due to your teeth being shorter than average, you can enhance their length with veneers. In addition, they can be a perfect alternative to orthodontic treatments if you have minor alignment and spacing issues. The can be used to make the teeth appear straighter without having to spend several months wearing braces. After scheduling an appointment with your cosmetic dentist in Cocoa Beach, a comprehensive treatment plan is created to begin restoring your smile. To begin the process, your teeth will be cleaned and lightly etched. This involves removing a small amount of enamel to ensure they sit flush on the teeth. Then, impressions are taken, which are used to create your new smile at a dental lab. It will take a couple of weeks for the veneers to be ready. While you wait, we will attach temporary ones. In about two weeks, you will come in for your final appointment and walk out with a new smile. Veneers will provide you with lasting results with the right care. Although they are not subject to decay, your underlying teeth can still suffer damage. Therefore, you need to continue to brush and floss your teeth with nonabrasive products while visiting your dentist regularly. While they are durable, they can break or crack if you are not careful. It is best to avoid using the teeth as tools and eating overly hard foods. With the right care, your new smile will last an average of 10 years before needing replaced. If you are ready to transform your smile into your best asset, it is time to see if porcelain veneers are right for you. Start your journey to beautiful teeth by contacting Nawrocki Dental to schedule an appointment.